Acoma Pueblo Poet and Writer Simon Ortiz said of Jose Matus, "He was one heck of a fighter, for sure! He kept the Indigenous presence in Tucson region going, no matter what. He was one who believed, No matter what: we are Indigenous. Yes, I believe him. And, yes, we believe him. Why not. We are Indigenous. No matter what. Thank you, Jose." This is what they called out, on this cold night in Flagstaff, "Last Train to Los Angeles." It has a poetic ring to it. My mind is not on Los Angeles, or the train, but on a writer and a great friend, both who left us too soon. When Charles Bowden wrote about the Sonoran Desert, no one did it better. When Chuck flopped down for a night's sleep on the desert, in that rattlesnake infested desert, with an eye out for Bighorn Sheep, Chuck made you love and fear the Sonoran Desert. And maybe it made you fear Chuck just a little too. Really, who would sleep on the desert sand surrounded by rattlers. It was the gracious, and funny, Charles Bowden that I had the gift of visiting with over dinner in a Mexican cafe during the Earth First trial in Prescott in the early 1990s. The Earth Firsters were there, and Charles was just off the anti-whaling ship Sea Shepherd. Someone mentioned that the thrashing open waters in violent weather, and the harshness of fighting whalers, was far from the romantic image that most of us imagined. Sitting in the El Minuto Cafe the other day in Tucson, I was remembering Charles Bowden, and was wondering why he had laid down and died. He was 69 and had just moved to Las Cruces after a lifetime in Tucson. There were too many writers and friends that had died along the border, and the cause of death never seemed clear enough. Over the albondigas soup and quesadilla, the lunch special, another wave of sadness came over me as I realized there was no chance my friend Jose Matus was going to walk in the door of the cafe, as he had done so many times. When he was a young man, Yaqui Spiritual Leaders asked Jose to travel south to the Yoeme villages in Mexico and bring the Medicine People, Deer Dancers, to Arizona to lead the Ceremonies. Jose spent his life doing this, driving six hours to the south near the Pacific Coast, and battling U.S. Border agents at Nogales to bring the Spiritual Leaders across the U.S. Border to lead Ceremonies. On one of these trips, Jose had a massive heart attack at the border. Still, he survived and kept going a few more years. Jose took his journey at age 66, while I was gone in December, but together, we had taken journeys spanning 23 years, beginning with a delegation of Tohono O'odham, Yaqui, Dakota and Hopi to the Zapatistas in the heart of the Lacandon Jungle in Chiapas in 1995. 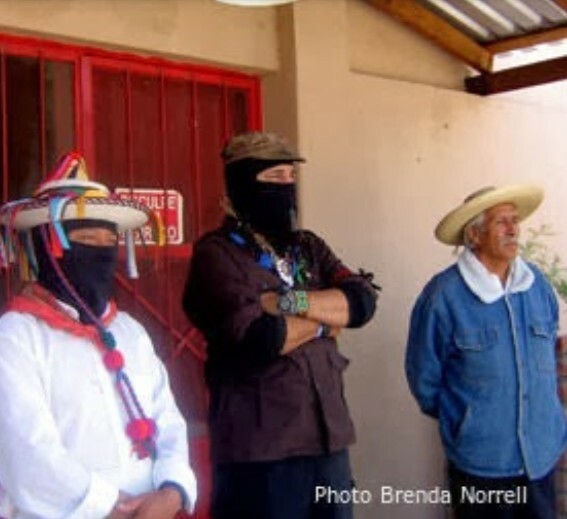 The delegation was asked to serve as human shields because the military was assassinating Zapatistas. Years later, Jose happened off the same plane in La Paz, Bolivia, just before I had a heart attack and helped me make it on to Cochabamba for the Mother Earth Conference in 2010. And in between there was a grand trip to the Yaqui villages in Sonora, and many more journeys, avoiding the border patrol and unjustified arrest. But this day, Jose would not be happening by while I was eating albondigas. We wouldn't be laughing this day. Still, as I remember the great prose of Charles Bowden, enticing me one more time to go into that vast desert alone, and as I remember laughing with Jose Matus, there is this richness of memory, and of journeys. So when the train guy calls out, "Last train to Los Angeles," the memories of their greatness fill my mind, and once again there is this journey. Simon J. Ortiz, Acoma Pueblo poet, writer, said, "I learned 3 or 4 years ago from Brenda Norrell's website that Jose Matus passed away. I miss him. I had not seen him in a couple of years I think. Since I did a daytime event in South Tucson 2 years ago. 1 year ago? I'm getting older too, just like him. And I forget too much and too many things too easily. Jose weathered a heart attack or two in the past as you know, but I guess it was time for him to take a rest. He was one heck of a fighter, for sure! He kept the Indigenous presence in Tucson region going, no matter what. He was one who believed, No matter what: we are Indigenous. Yes, I believe him. And, yes, we believe him. Why not. We are Indigenous. No matter what. Thank you, Jose." Brenda Norrell began as a news reporter at Navajo Times during the 18 years she lived on the Navajo Nation. She was a stringer for AP and USA Today. After serving as a longtime staff reporter for Indian Country Today, she was censored and terminated in 2006. She created Censored News as a result. It is now in its 12th year with 18 million pageviews, with no ads or revenues.